The Fair that is known as the satellite event, during Manhattan’s celebrated Rare Book Week, has great news for the hundreds of followers who pack its aisles each year, searching for the exceptional “finds” that have made this event a stand out. The fifth edition of the New York City Book & Ephemera Fair has added, by popular demand, a second day when it returns to the Sheraton Central Park/Times Square hotel, on 7th Avenue between 52 & 53 Streets, Saturday March 9th & Sunday March 10th. Over 100 rare book and ephemera dealers from all parts of the country and Europe are featured - up from 65 last year. This is the show where first editions, beloved classics, fine & rare books, autographed historical documents, vintage photography, old maps, and more, are just waiting to be discovered. Now, show goers will have an extra day to take it all in! Premiering this year is the first annual Booklyn Artists’ Book Fair (BABF) - a special section devoted to contemporary artists’ books, that is literally a fair-within-a-fair! Curated and organized by Marshall Weber, co-founder of Booklyn, a dynamic, artist-run non-profit organization based in Booklyn, the inaugural event’ features over 40 tables of work by member artists and artists groups. While books by well-known artists are prized by museums, libraries and educational institutions, the increase in awareness of artists’ books has been spurred by a new generation of cutting-edge young artists, working in a variety of media -- aquatint, collage, fine letterpress, hand-painted , photo-art, screen prints and risograph, They produce unique books that not only express their own vision, but communicate ideas that are of timely concern. Chilean-born BABF exhibitor, Maria Veronica San Martin’s powerful books are deeply connected to the deconstructions of the Pinochet era in her native country and its missing war victims. Internationally known artist Xu Bing, has turned recently to the impact of modern technology on the environment and the human mind in his work. Swarthmore College’s “Friends, Peace and Sanctuary” will premiere collaborations between American artist bookmakers and artists, poets and artisans from the Syrian and Iraqi refugee community in Philadelphia. The fair will also showcase provocative new work, including the New York premiere of Sofia Szamosi’s “#Metoo On Instagram: One Year Later”, along with vibrant pop-up books from artist, Collette Fu. This year the New York City Book & Ephemera Fair is also proud to present a special exhibition, “The Celluloid Babylon,” of photography by visionary artist, William Mortensen whose controversial images launched a whole new photographic movement in the 1930s and 40s. Curated by author/art historian, Brian Chidester, courtesy of the Stephen Romano Gallery, the exhibition draws from the artist’s celluloid years, starting at the point, where, as a costume designer, he worked on Cecile B. DeMille’s epic Hollywood film, The King of Kings. The artist decided one day to snap photographs of the actors while they were moving around in his opulent costume designs. Director DeMille immediately saw the marketing potential of having such images available prior to the film’s release. The movie lobby poster was born! The exhibition highlights these golden years when stars such as Faye Wray, Jean Harlow, John Barrymore and Rudolph Barrymore were the subjects of his photographic creations. And then there are the books - wonderful first editions, beloved classics and fine books on almost every subject imaginable! For Star War buffs, exhibitor Pryor & Johnson Rare books will have a first edition of “Star Wars,” that was ghost-written by Alan Dean Foster. It appeared before the first film debuted and made history. Harry Potter devotees will love Pryor & Johnson’s first two volumes of the Harry Potter series, both signed by Rowling. The first limited edition of William Faulkner's Snopes Trilogy, each volume signed by Faulkner, is another special find from this rare book specialist. Exhibitor Stan Gorski calls on Stephen King followers to check out an early King book called Firestarter. Zoe Abrams rare books take us back in time with a series of almanacs & agendas documenting more than a century of merchant life in Ghent (ca. 1720-1845). They are a delight to behold! Pre-purchase a weekend pass online and save $5 or register for a complimentary pass for Sunday, March 10 - http://bit.ly/NYCBook19. 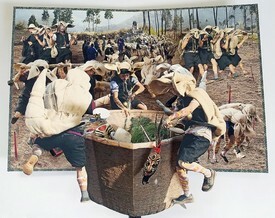 Image: Luoma, Yi Tiger Festival, Photographic Pop-up Book. The Yi people from China’s Yunan province, worship the tiger as their grandest totem. disturbed by Under the direction of the black “Tiger King,” they offer sacrifice and dance to reflect the journey and way of life of the Yi people as they visit each house to guard the village from evils. Thus “Luoma,” the Tiger Festival, was created to display the Yi people’s tiger-like strength and valor. Artist: COLETTE FU makes one-of-a-kind artist’s books that combine photography and pop-up paper engineering.